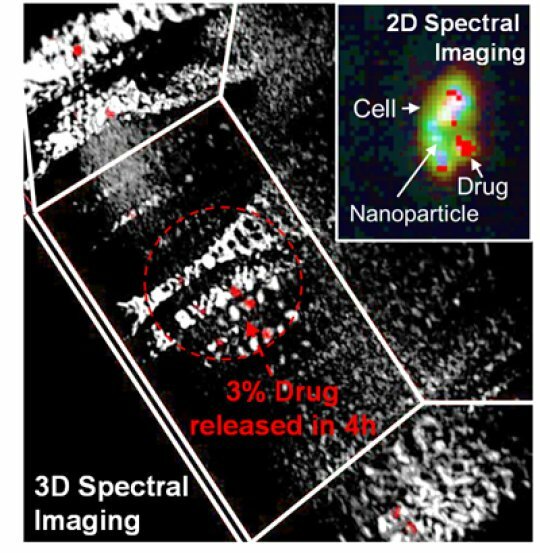 Hyperspectral imaging detects and quantifies delivery of drug from a nanoparticle in a 3-D space. Dotted arrow and circle indicate that only 3 percent of the drug has been released from the particles after 4h. Pan explained that current drug delivery platforms suffer from major burdens (e.g., evading the immune system to reach the target tissue). Since these delivery vehicles encounter multiple barriers en route their target, premature release of the drugs from the cargo often leads to unsuccessful outcome. In the past, researchers have shown that the release of drug can be studied in test tubes, however, the quantification is not trivial in the presence of a living cell. Pan’s research group designed three systems comprising spherical, zwitterionic (a neutral molecule with both positive and negative electrical charges) phospholipid-stabilized nanoparticles as a model system for delivering fluorescent and non-fluorescent drugs — demonstrating the concept with an FDA-approved anticancer drug on breast cancer cells. Web Source: University of Illinois College of Engineering.